Please click on link below for site navigation. 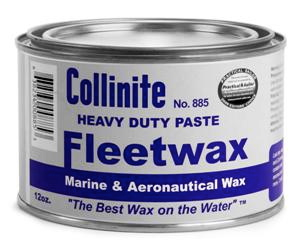 Original Heavy Duty Paste Fleetwax is rated "Editor's Choice", Powerboat Reports and #1 by Practical Sailor. Developed especially to seal and shield against acid rain, sun, salt spray, bugs and other environmental acids for marine and aeronautical finishes. Easily applied and non-abrasive, this product will prevent finish deterioration and adhesion of foreign elements. Goes on easy and stays on all season for a wipe and shine deck, glistening top sides and a super slippery bottom. Contains a special pure Carnauba wax formula proven in harsh industrial environments. It will easily shrug off scrubbing, scuffing, detergents, salt and marine organisms...all year long. Cleans, protects and beautifies marine finishes in one easy step. No hard rubbing or buffing. Contains rare, pure Carnauba waxes combined with advanced polymer technology. Leaves double coating of protection that lasts and lasts. The easy to use liquid metal wax cleans and protects chrome, aluminum (anodized, also), copper, brass and stainless steel in one easy step. Will safely remove rust and salt deposits while protecting marine fittings/accessories and car, truck, and motorcycle metal finishes. Contains neither strong acid, nor harsh alkali. Cleans, beautifies and protects leather and vinyl automotive, marine, aircraft, and household upholstery in a single, easy operation. Leaves a high gloss with a protective coating against wear, deterioration, spills and oxidation. Can be easily cleaned with a damp cloth. Easily removes dirt, film, oxidation, oil, grease, rust and exhaust stains from fiberglass finishes. Restores the original color quickly without hard rubbing or buffing. Leaves a chemically clean surface to which Collinite waxes can bond perfectly. Increases long-lasting brilliance and performance of protective wax coating. This special, heavy duty, detergent proof formulation provides a very high gloss, almost indestructible protective coating for personal watercraft and jet boats. It insulates the surface against the adhesion of foreign elements and assures full protection against deterioration, sun, rain, salt spray and exhaust stains. Increases speed and reduces fuel costs. For more information, contact us by e-mail at collinite@waxbytes.com. Last modified January 2, 2017. Copyright © 2017 by Wax Bytes.